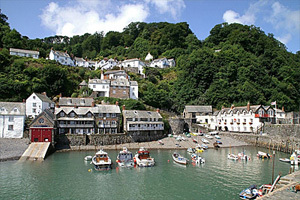 A unique timeless village on Devon's north coast with winding cobbled streets that run steeply down to a small sheltered harbour. 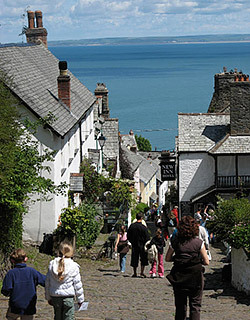 Due to its isolation and traffic free streets, Clovelly has remained virtually unchanged and unspoilt for hundreds of years. This little fishing village really lives up to its picture-postcard image, and is a strong favourite with photographers and artists. The long cobbled High Street, known as Down-a-long or Up-a-long (depending on which way you're facing), descends in steps down through the village to the picturesque 14th-c quay and pebbly beach. Colourful window-boxes and flowering shrubs deck the tiny whitewashed cottages that cling to the hillside, one on top of the other, all the way down. The small quay at the bottom is protected from the sea by a curving breakwater, where fishing and pleasure boats take shelter. The shingle beach front is lined with traditional stone built fishermen's cottages, balconied houses, an old seafarers inn and a lifeboat station. The whole village remains closed to traffic and visitors must use the car park at the top of the hill, next to the modern Clovelly Visitor's Centre. The centre has shops, refreshments and an exhibition on the history of the village. Note: there is an entrance fee into the village, which includes access to a museum dedicated to the writer Charles Kingsley (who once lived in Clovelly as a young boy) and a restored period fisherman's cottage. The most attractive way into the village is along Hobby Drive, a 3 mile (5 km) toll road that runs from the A39 near Buck's Cross to the village car park, passing through scenic woodlands with breathtaking views. In fact the densely wooded cliffs all around the village provide pleasant walking territory. The 400 ft (120 m) high cliffs provide superb sea views, particularly from Gallantry Bower. A ancient hill-fort also stands on above the village (not open to public).